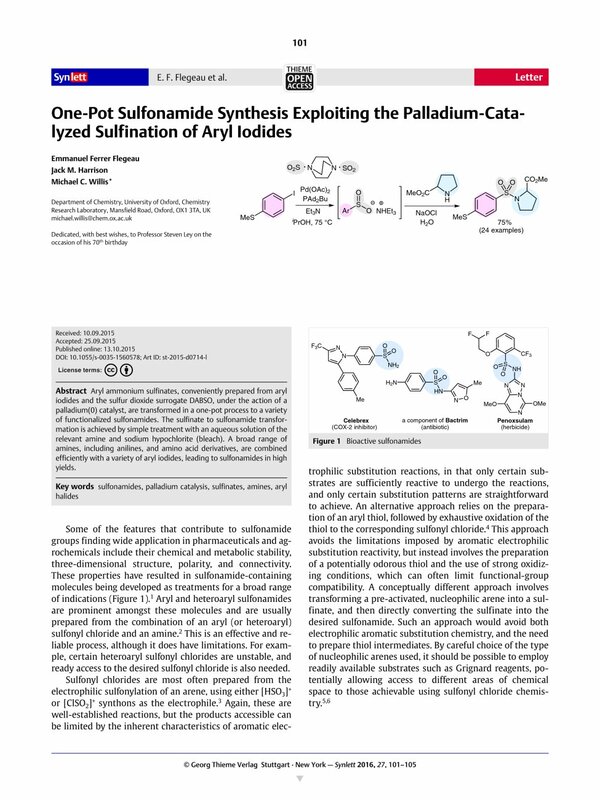 Aryl ammonium sulfinates, conveniently prepared from aryl iodides and the sulfur dioxide surrogate DABSO, under the action of a palladium(0) catalyst, are transformed in a one-pot process to a variety of functionalized sulfonamides. The sulfinate to sulfonamide transformation is achieved by simple treatment with an aqueous solution of the relevant amine and sodium hypochlorite (bleach). A broad range of amines, including anilines, and amino acid derivatives, are combined efficiently with a variety of aryl iodides, leading to sulfonamides in high yields. Supporting information for this article is freely available online at http://dx.doi.org/10.1055/s-0035-1560578 and includes experimental procedures and associated characterization data.